Are there any watermelon fans out there? Anyone, anyone? Yeah, I thought so. My family is 6/6 for giving two thumbs up on this summer fruit, so we had no reservations about partnering with the National Watermelon Promotion Board on today’s sponsored post. 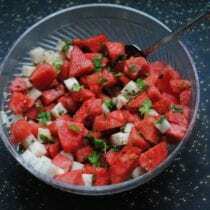 So, read on as we share the benefits of watermelon as well as a new yummy recipe … oh, and don’t miss the fun contest at the very bottom, too! Did you know you can actually use the whole watermelon? Of course, we all love to eat the juicy flesh, but did you know there are even some uses for the rind? It can be used in recipes, as serving vessels, and in centerpieces. Those who compost can use it in this fashion, too. Check out this carved piece that I did for a picnic five years ago. Can I tell you that my kids thought I was the absolute COOLEST? :) Worth the effort! 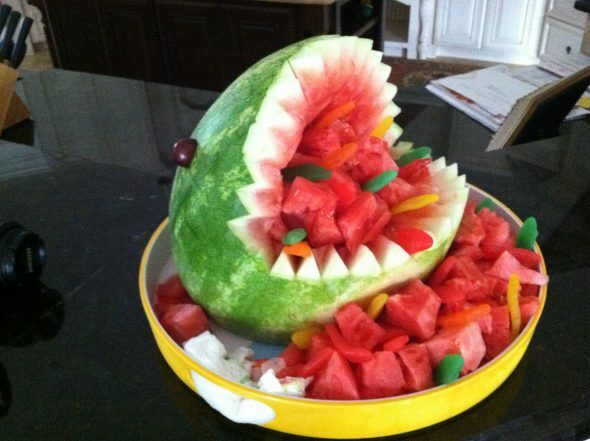 Note that this was before I knew the negatives about food dyes, so yes, it has some Swedish Fish coming out of the shark’s mouth. I’m sure that you could leave these out or find a substitute. Something else to consider, overripe watermelons don’t need to be thrown out. Instead, you can throw them into a smoothie or juice them or even puree and freeze them in popsicle molds. Another fun fact about watermelon: one whole melon can feed up to three dozen people. Wow! And it’s also #1 on the list of budget friendly fruits (obviously with it feeding so many), according to the 2010 Perishables Group Study, at only 14 cents per serving. While the flesh is obviously delicious even when eaten by itself, it can also be diced into salads and salsas, grilled, and more. So, today I am sharing a new recipe for inspiration. My first instinct was to mix it up with some Mexican flavors, and I’ve gotta say – it turned out really good! Who knew that you could get crunchy, sweet, salty, slightly spicy, and sour all in one dish? Enjoy! 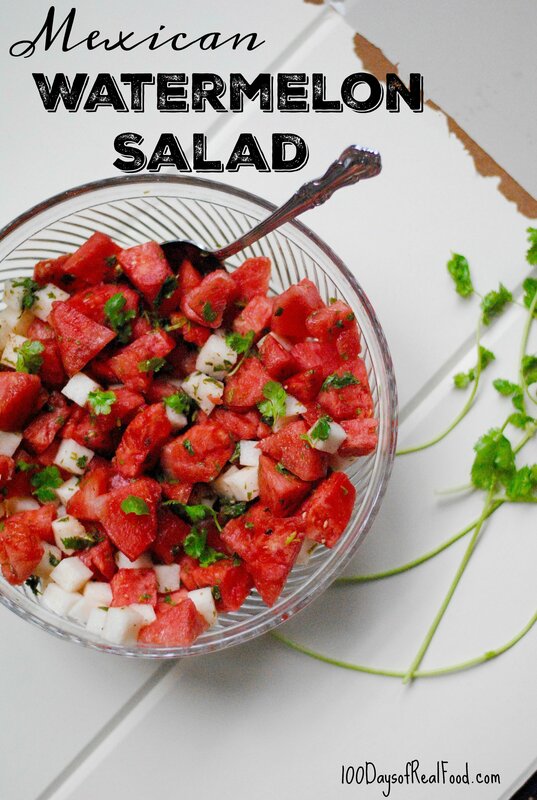 In a medium bowl, combine watermelon and jicama. Gently fold in cilantro. In a small bowl, mix lime juice, chili powder, and salt until well-combined. Add mixture to medium bowl and stir to coat. 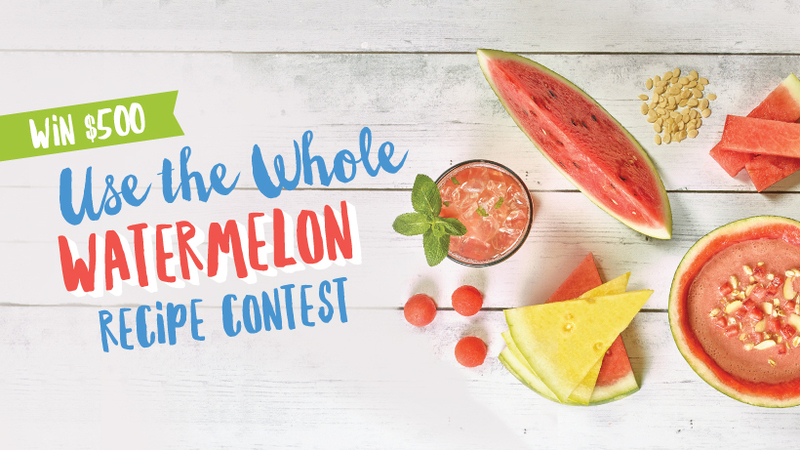 Submit your watermelon recipe using any part of the watermelon (categories include Flesh, Juice, and Rind) to be entered to win up to $500! really nice recipe, thank you, I forget about jicama, I only have it when in Mexico it seems like, when they serve it regularly, really like it too since the flavor is so different, thank you for the watermelon tips too! Well, this doesn’t feed us directly, but our chickens love to peck at the watermelon rinds, even when it’s a bowl-shaped half of the watermelon with everything inside scooped out. It’s entertainment and food for them. Then, of course, they give us eggs, so it’s all good. Waste not, want not!